This is a sketch challenge you can find here and I found it difficult getting the arch symmetrical but I'm pleased with the end result after enjoying some time painting and smudging with distress inks and gel pens. Voici ma carte selon le sketch de la semaine ici. 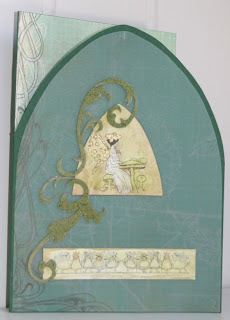 Used: Papermania vellum with matching paper inside the card (cut from 12x12 pieces), grungeboard pieces and printed images painted with diluted shabby shutters and frayed burlap distress inks with gel pen highlights painted in on the fairies. 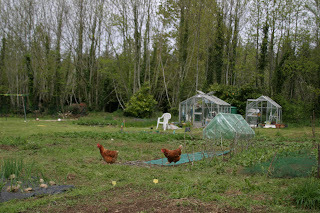 You could be forgiven for thinking that all I'm doing at the moment is blog-hopping but it's not true! Here's what I made last night: Yes, I made it all - the covering of card, sticking together, hammering holes through, the lot ! Are you getting the impression I'm pleased with myself ? I'm happy that not only did I make this but I did it at a french craft group so I had to keep up with some pretty technical french at top speed! 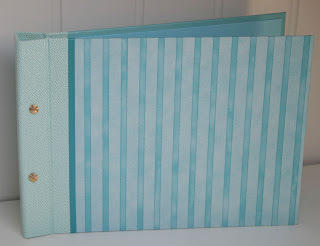 We're meeting again in 3 weeks when we'll make covering boxes to house our albums. 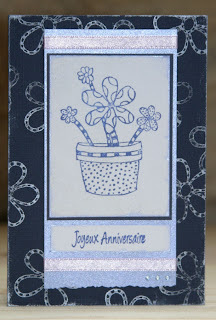 Used: 2.5mm thick card, Papermania & other papers, Anita's sticky ribbon, and Skivertex (French make (I think?) of coated thick papers) used here on the spine. Congrats to Lil Deb: She has reached the 2000 mark & has candy to celebrate here. and Enfys is celebrating 40000 (!!!) hits here ! Charlie has had 15000+ hits on her blog which has also just had its first birthday so candy on offer to celebrate here. Congrats to Charlie & blog! This week's Funky Fairy Challenge is Summer-themed: To create something summery - "Think summer colours, summer images, totally hot!" I have created 2 things: I covered an old school exercise book with Funky Fairy Colourful Daze papers and alphas and decorated this with Morsels Beach Collection stamps and my Whispers markers. 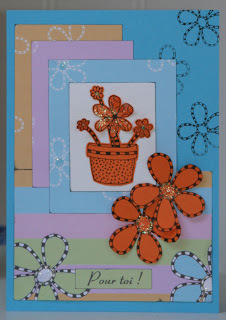 I then created a card using Funky Flowers papers and Doodles for Daniel flower stamps and a splash of holographic glitter. and Heidi has Hanglar blog candy here. The Funky Fairy challenge this week was set by Lou and she has asked us to make a card/layout using no backing papers whatsoever! 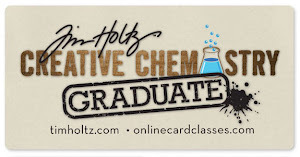 "All backgrounds must either be stamped, inked, painted or chalked (for example) and any topper or embellishment must also be made using a rubber stamped design/image. The sentiment as well should be stamped and not printed from the computer or a rub-off. The only concession to paper/card that will be made, is for matting and layering purposes only." Here's my card: I used Funky Fairy Doodles for Daniel stamps (background and main image) and played with my new pearly lavender Brilliance ink pad on navy textured card and used Brilliance royal blue for the main image and the sentiment. Edged card and image piece with pearly lavender, matted and layered and added ribbon and gems to finish. Could have coloured the flowers but like the almost monochrome look. Just another quick card loosely based on the Funky Fairy Challenge this week, and a reminder: You only have until tomorrow, Saturday 17th 2008 (UK time), to enter the Funky Fairy Blog Candy draw so click here quick! 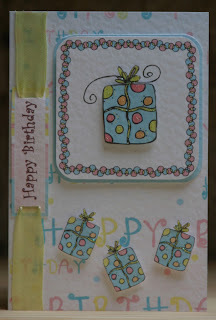 Card made using Funky Fairy's 'Funky Birthday' collection. Front: Inside: Don't you think the toad got away lightly?! For me, it just had to be a Mother's Day card, which is 25th May 2008 here in France. The backing pieces and small flowers have been salvaged from another card which is why it fits the Daring Cardmakers Challenge to recycle cards, etc. I rearranged the pieces with the decoupage hiding some old marks, coloured and added the peel-off sentiment and finally added the gem. The green backing paper used inside is from Funky Fairy's 'Cool Co-ordinates' and you'll see I gusseted the card to allow for the decoupage. 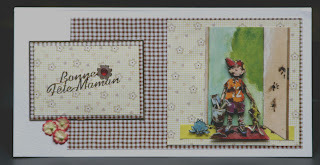 The decoupage is from a new French magazine: Passion Cartes Creative. 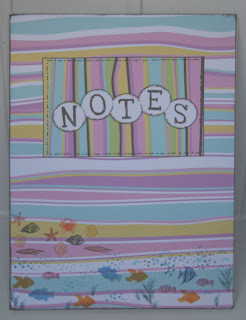 and my interpretation of that is another summer inspired card. This time it feels like summer too: We were down the beach yesterday afternoon and probably will be again today! It's a Bank Holiday weekend here in France and it is baking hot! 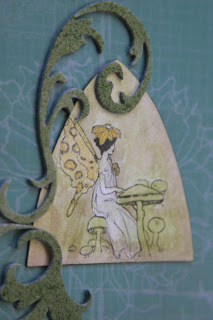 I used Funky Fairy 'Lagoona' papers which I layered and matted, and printed and stamped on. Funky Fairy Blog Candy !!! of Fairy would you be?! So as they say, "You have to be in it to win it". We can't wait to see what type of fairy you are. Regardless of the blog candy draw there are also fabby and very generous downloads available to everyone so it is definitely worth a look! This week's Funky Fairy Challenge, set by Hannah, is "Going Dotty" - Just use some kind of dots or spots on your project. Really recommend you have a look at the great cards the rest of the team have done on the challenge blog and also the Inspirations blog for others' fab work and the latest free downloads: You won't want to miss the Doodlementals kit! 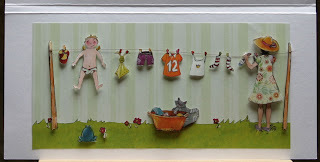 Here's my ready-for-summer card which has worked a treat as the weather has been great today. Singing "She wore an itsy bitsy teeny weeny yellow-polka dot bikini..." also made me feel sunny! I have used 7 shades of the dotty pattern in Funky Fairy's Basics set and shaped the card front to fit the bigger dots of card that I have layered up. I drew the bikini and doodled the extra dots, inked the edges of the circles and added Anita's peel-offs.